Wangiella is a dematiaceous, cosmopolitan fungus that inhabits the soil and plant material. Wangiella may cause various infections in humans. prefer to classify it in the genus Exophiala as Exophiala dermatitidis . See the summary of synonyms for the Wangiella spp. Wangiella dermatitidis is an occasional causative agent of phaeohyphomycosis. Subcutaneous phaehypomycosis  is the most common clinical picture. The infection develops after traumatic implantation of the fungus through the skin. 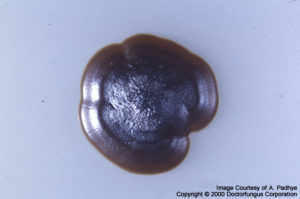 Wangiella dermatitidis is a neurotropic fungus. Central nervous system infections have been reported . It may also cause keratitis, otitis, pneumonia, and endocarditis . Disseminated infections may develop particularly in immunocompromised patients. Wangiella dermatitidis may cause bovine abortion and still birth . Colonies of Wangiella dermatitidis grow slowly. On potato dextrose agar and after incubation at 25°C, the colonies are initially moist, yeast-like, and shiny. Aerial hyphae develop after 3 to 4 weeks of incubation. The color is black from the front and the reverse [1295, 2144]. Wangiella dermatitidis can grow at temperatures as high as 42°C and does not assimilate potassium nitrate [1295, 2144]. The monoclonal antibody used in “Pastorex” Aspergillus antigen test for detection of Aspergillus galactomannan antigen may cross react with Wangiella dermatitidis . Septate, brown hyphae, conidiophores, phialides, and yeast cells are observed. When a young culture is examined microscopically, the predominant structure is phaeoid (brown), budding, yeast-like cells. As the colony gets older, hyphae and phialides are produced from these cells. 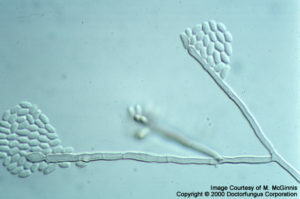 Conidiophores are usually poorly differentiated from vegetative hyphae. Phialides are brown, and flask-shaped to cylindrical. They do not have collarettes. 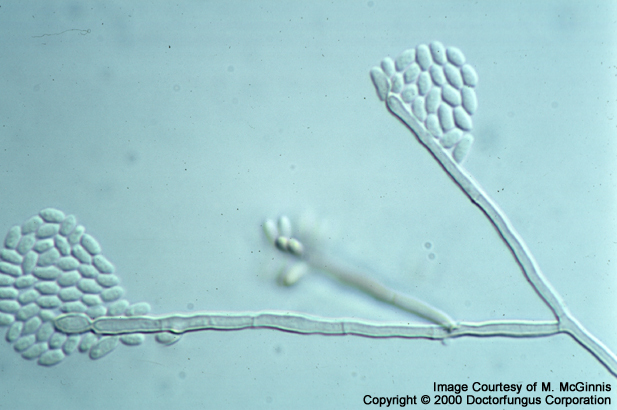 Conidia (2-4 x 2.5-6 µm) are brown, one-celled, and round to oval in shape. They are found in clusters at the apices of the phialides and down the sides of the conidiophores [1295, 2144]. Unlike Exophiala spp., Wangiella dermatitidis produces phialides, but not annelides. However and exceptionally, annelide production has been observed in some isolates of Wangiella dermatitidis . Wangiella differs from Exophiala by its ability to grow at 42°C , the absence of annelides, and inability to assimilate potassium nitrate. Very limited data are available. Amphotericin B , itraconazole [1490, 2212], terbinafine, and voriconazole  are active in vitro against Wangiella dermatitidis. Voriconazole yields lower MICs compared to itraconazole . Optimal medical treatment of Wangiella infections is not well-known. Surgical excision appears as the treatment of choice in cases with subcutaneous infection . Amphotericin B alone or in combination with ketoconazole and rifampin have been used .